"Rube" is the incredible true story of the most colorful character in the annals of American sports. 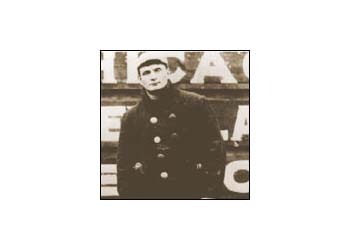 George Edward "Rube" Waddell was consummate "Peter Pan," a child's mentality trapped in a giant, powerful body. Rube, the screenplay, has the elements of a classic Greek tragedy, with Rube Waddell cast as the classical, flawed mythological hero - he had an "Achilles brain." Dan O'Brien's screenplay advanced to the quarterfinals of the Bluecat Screenplay Contest, a competition that received more than 3,000 entries. "The narrative is framed as the reminiscences of another baseball great, Connie Mack, as he talks to two young fans, Joe and Petey, in the 1950s. This positions the audience nicely - fans of the game may be familiar with players from the 1920s onwards (as are Joe and Petey), but Rube may well be a completely unfamiliar name, despite his record-breaking stats. The world portrayed in Mack's account is a much more colorful, organic one than current pro-sports. It has a carnival sideshow aspect to it, with alligator wrestling and music hall extravaganza, providing lively alternatives to action on the field. Rube is a larger-than-life character, a giant of a man with a child-like mind, and his random decision making processes make for an unpredictable career." Screenwriter Dan O'Brien focuses primarily on Rube's years with the legendary Connie Mack, the only manager who seemed capable of controlling the eccentric Waddell. 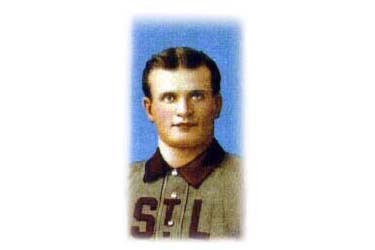 Under Mack's guidance, Waddell put up Hall of Fame numbers and rose to superstar prominence as baseball's biggest drawing card. Waddell's unpredictable nature, however, presented immense challenges to the patient, soft-spoken Mack. 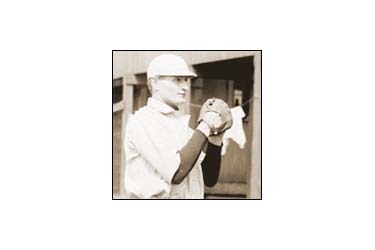 Waddell would occasional miss scheduled pitching assignments, choosing instead to play marbles with street urchins or take off on numerous fishing adventures. 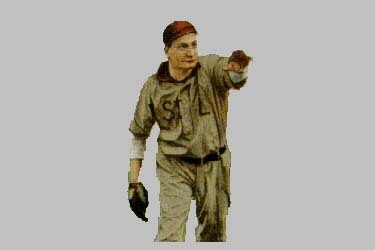 Already given away by his former team, Rube's mythos continues to gain momentum, as later, at the livery, Connie is warned against calling him 'Rube.' We can readily sense Connie's cautious sensibilities taking over. After a brief introductory period over an ample lunch, both men are followed by business owners after catching word that Connie is, in fact, (attempting) to settle Rube's debts. This veritable farewell party leads to Rube's entrance on the mound. Fresh from hard work at the livery, ready to pitch, Rube emerges from the waiting crowd, commanding the sort of charisma likened to '..the Red Sea parting.' Here, Rube enters the fray one part matador, one part gladiator. The cumulative effect is highly-intriguing as a sea of small details begin to paint the picture of a folk-hero. Later, we see Ban Johnson, speaking to baseball executives, espousing the importance of maintaining the "integrity" of the game-- You (O'Brien) cleverly intercut scenes of a defiant Rube mouthing off to umpires and carrying on in a manner contradictory to Johnson's decidedly stuffy speech. Very well done! Besides Connie Mack, Rube's most influential relationship is with Osee Schrecongost, his catcher and best friend. Osee also exhibits eccentric tendencies but also displays an ability to mature, which Rube lacked, especially upon meeting, Jenny June, the love of his life. "Osee engages a young woman, Jenny June, in a roundabout fashion after soiling her boots with tobacco-infused spit. Just as soon as Osee expects to be cursed and cudgeled for the impropriety, Jenny June not only introduces herself, but even shows keen interest in one of the 'Rube Waddell' Cigars-- Looking every bit the seasoned aficionado as she deftly smells for quality, she bites off the end and proceeds to take a satisfying drag. Just as (old) Connie Mack appears to be an anachronism in the context of the 1950s, Jenny June, in kind, displays a typically unseen, (if not discouraged) independence and spirit that clearly impresses Osee. Their slightly clumsy introduction is enjoyable to read." 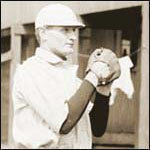 Mackand Osee remained staunch supports Rube but, as the pitcher's physical skills begin to erode, others took a much critical look at Rube's quirky behavior including sportswriter Charlie Fogler. To the opposite extreme was teammate Danny Hoffman. 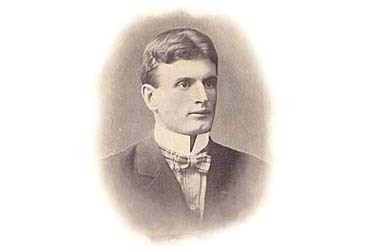 A vocal critic of Rube's antics, Hoffman changed his tune when Rube saved his life. Rube coming to the aid of the seriously injured Hoffman is a nice touch. Despite Hoffman's perpetually icy demeanor, Rube seeks to help him and even compliment him in the process, "Aw, shucks, Hoff. Connie can always find another pitcher. A centerfielder like you is hard to find." This is a real testament to Rube's 'Peter Pan' aura and his soft heart. Hoffman's case was not the first, nor last, instance in which Rube came to the rescue. His heroic efforts during a major flood along the Mississippi River, led to his premature death in 1914, a few months shy of his 38th birthday. By the end of the script, we see an ever-humble Rube, patrolling the flooded streets by lamplight after impressing his fellow townspeople with his yeoman work-ethic. All through the course of his hard work, he shows signs of tuberculosis, (specifically, a nagging cough) and news of his illness makes its way to his ex-teammates-- After he dies, his adversaries and colleagues alike, from Ban Johnson to Ty Cobb, offer their poignant sentiments in his honor. Charlie Fogler's circuitous writings from page 104 are an especially clever homage to Rube. 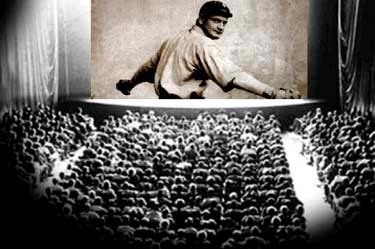 For more on the remarkable life and career of Rube Waddell click the links on this website or contact screenwriter Dan O'Brien: dan@rubewaddell.net.